It’s 2018 and working moms are the norm. According to the US Department of Labor, 70% of mothers with children under 18 participate in the labor force, with over 75% employed full-time. It’s no wonder then that more than ever before, companies are making it a priority to provide great facilities for pumping for their lactating moms in the office. Beyond just being a nice perk, lactation rooms are also the law. Thanks to the Section 7 of the Fair Labor Standards Act, employers with greater than 50 employees must provide both reasonable break time and a place other than a bathroom for nursing moms to express milk. 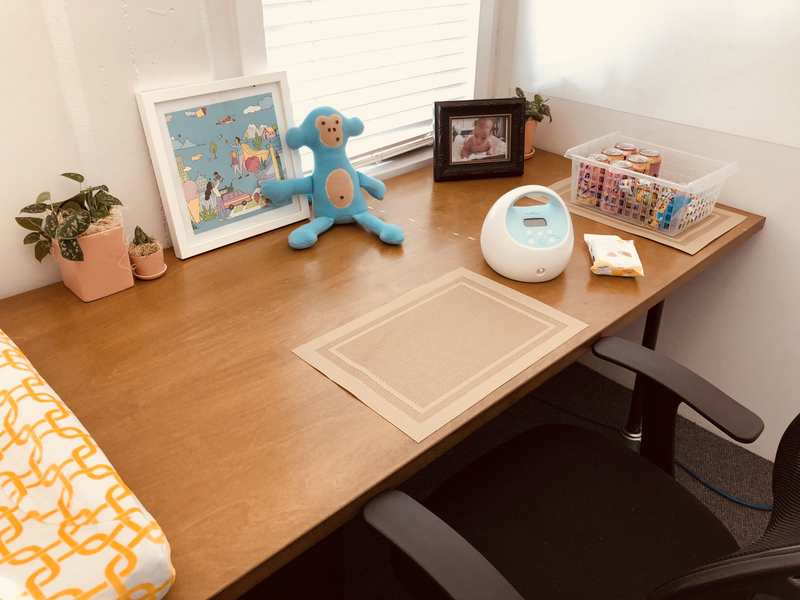 Even if you don’t have 50 employees, providing a lactation room for nursing moms will almost certainly help them transition back to work more easily, increasing employee efficiency and retention. At Winnie, we’re a small team working out of a large loft space with an open floor plan. When we set out to create a lactation space, the project felt a bit daunting. There aren’t many resources online for how to build one and standalone options like nursing pods that are sold for $20,000 were way out of our budget. But it turns out it doesn’t have to be time consuming or expensive to provide the perfect space for breastfeeding moms to pump, even if you’re a startup or small business without a spare room. We wanted to share how we did it for under $1000 so you can too. First things first. The most challenging part of creating a lactation room is creating the physical room itself. It’s ideal if the room has no other purpose and no access to anyone other than lactating moms. This is because nursing moms need to pump on a schedule and you don’t want someone’s meeting or meditation time to prevent your lactating employees from pumping (which can lead to a serious and painful medical condition). If you have an extra conference room or even walk-in closet in your office, this is an ideal space to start with as then you’re just responsible for making the space clean, private, comfortable and adding the equipment described below. If, like Winnie’s office, you don’t have an extra conference room or closet, your best best is to create a private room within your larger space. The advantage of this approach is you can make the room as large or small as you need and absolutely no one besides lactating moms will ever need to access it. So how do you do that without a major renovation? 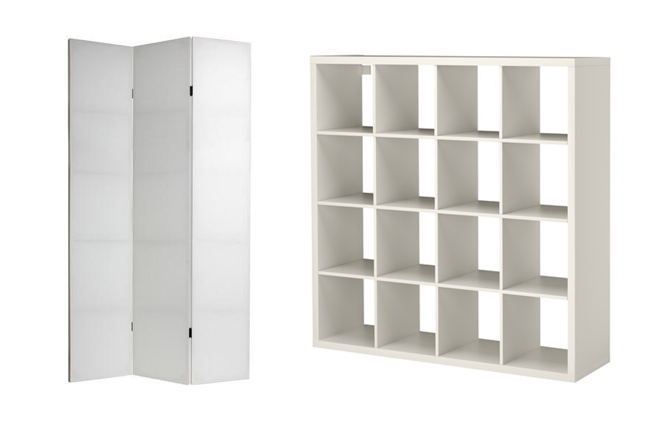 We created a makeshift room in our office by utilizing two Ikea Kallax bookshelves and two tall room dividers. 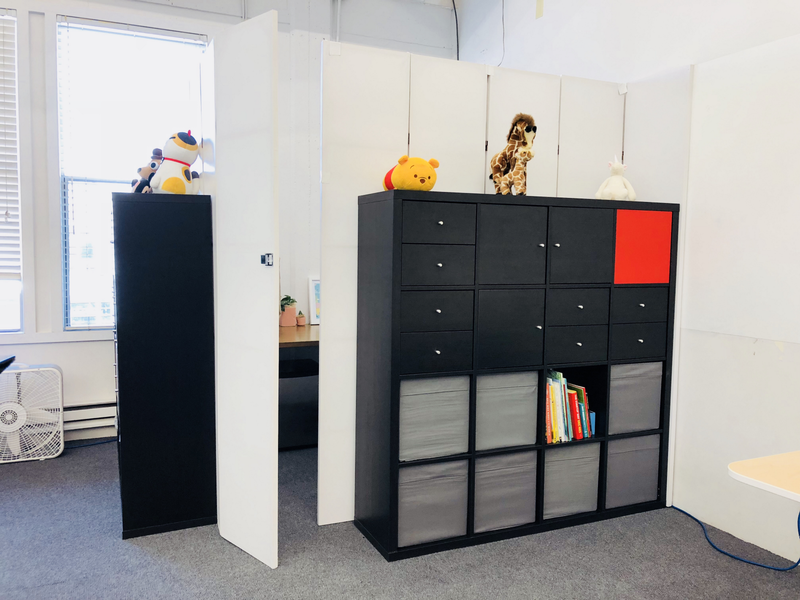 The bookshelves provide stability and some noise cancellation and the tall dividers make it so that no one can see into the room and also create a “door” since they can open and close freely (and we added a door knob for an extra touch). Because we set up our lactation space in a corner of the office, we were able to utilize the existing walls and only needed to create two of our own walls. We nailed the dividers to the wall for extra stability. Finally, make sure your room has access to electrical outlets as those are required for the pump, refrigerator (see section below), and things like a laptop charger. Your initial thought for a chair might be some sort of comfy glider or rocking chair setup. Not only are these expensive they are also not useful for a lactation room. Unlike when breastfeeding a baby, when you’re pumping it actually helps to sit upright with your feet flat on the floor. A spare desk chair works great for this purpose — an adjustable chair like this is ideal — and chances are you have an extra one lying around your office. A table is also really key and honestly a spare desk works great for this purpose because it will provide plenty of counter space. Some women might want to get some work done and some may want to eat, drink, or just listen to a podcast. Either way having a clean table in front of the chair is useful for all the parts and accessories that they need to put somewhere. The last thing you want is someone knocking over some of their freshly pumped milk because they didn’t have enough space to maneuver. It’s really nice to have a separate fridge in the lactation room exclusively for pumping moms. It’s not only more desirable for pumping moms to store their freshly pumped milk in a refrigerator that doesn’t contain someone else’s leftover tuna sandwich, it also allows moms to bag up their used pump parts during the day and stick them in the fridge. This way they don’t have to be washing their parts session to the session, a huge time saver. When you’re pumping 3 or more times a day, every minute counts! For bonus points, include some bottled water in the fridge (or La Croix) because pumping can make you extremely thirsty. A sink is really nice because it allows lactating moms to wash their pump parts between uses, which is the current guideline from the CDC. But don’t give up if you can’t make a sink happen. We weren’t able to swing a sink at Winnie because we just don’t have the water hookups. There are a few alternatives to a sink though. First, you’ll want to provide your pumping moms with bus bins they can use to take their pump parts to the nearest sink. Second, you’ll also want to provide plastic bags as some pumping moms will prefer to put their pump parts in a large ziploc bag and just refrigerate between uses. Finally, there are special wipes you can use to wipe down pump parts when you don’t have access to soap and water. While it’s certainly not required to provide a breast pump, a hospital grade pump like the medela symphony pump is both quieter and more efficient than many alternatives. Many women find that with a hospital grade pump they are able to pump more milk in a shorter period of time. Feeling sticker shock at the price? Most hospitals, baby stores, and baby resource centers will rent you hospital grade breast pumps for less than $100/month. Let this be a collaborative process with the moms who will be using the room, if they are open to it. It will not only produce a space your lactating employees are happier with, it will also show them you care and want to support them as they transition back to work. Small personal touches — like a space for moms to put photos of their babies — can go a long way and won’t cost you much!